Clear span structures are possible with efficient geometric configurations. Architects have been challenged to cover the largest space possible with the least amount of material for centuries. Geometry principles from the Pythagorean theorem to Euclidian math have been the basis for their exploration and structural calculations of physical forms. Architects and engineers have been able to span ever-larger distances without columns using basic geometric principles. They balance the weight of physical members and environmental loads by spreading the loads across numerous members. Reducing the weight of the structure without losing the strength of the members by means of efficient geometries allows designers to use less metal in their structures. With the advent of computer modeling, new geometric forms are becoming even more viable. With the use of aluminum, large structures using complex geometric forms are lighter, stronger and can span greater area. This large, enclosed, trapezoidal aluminum truss has a span of 135 feet at one end and 106 feet at the other, definitely making a statement about the power of engineering at the entry Lockheed Martin Aeronautics in Fort Worth, Texas. Spaceframes became popular in the seventies and are made up of a series of struts and nodes creating triangulation in each face. Spaceframes can work with and without curvature. Based on the geometry of crystals, with repeating units of structure, lattice designs are widely used to create unique structural solutions. Geometric framing configurations can be developed by using standard three dimensional spaceframe framing, a single layer lattice or reinforced stiffened shells and a combination of a single layer grid reinforced structurally by three dimensional trussing. 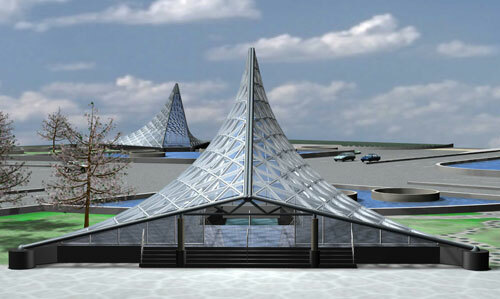 Although one might assume that these structures are envisioned by computer modeling. In fact, many architects sketch their designs for the fabricator who then develops the intricate geometry to meet the necessary structural requirements. A single-layer lamella enclosure in Shanghai is shaped like a very large egg that contains the planets in the universe. It spans one hundred and sixty feet and it is thirty feet high and hundred and ten feet at its widest point. This canopy has no columns or sub-steel framing. It is made of three types of ten-foot long aluminum extrusions. A lamella structure is a domed structure that can be created by forming a network of perpendicular ribs that appear to be diagonal in plan. The advantages of this type of geometry “– in addition to an economy of materials — is the use of the repetition of similar elements and joint details. Another advantage is in the use of straight linear elements to produce the curved vaulted surface.”3 Working with the fabricator, this egg-shaped dome was made possible only because the metal was designed where it was needed saving material and installation costs. The mill finish aluminum spaceframe over the Lynx Bus Station in Orlando, Florida spans 88,000 SF designed by Helman Hurley Charvat Peacock Architects is curved to represent movement. 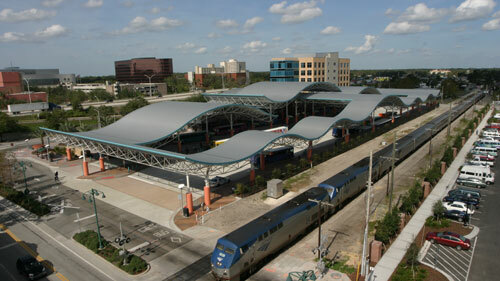 The space frame for the Lynx Bus station in Orlando, Florida is an example of a curved, trapezoidal structure that has thirty-three different radii and covers eighty-eight thousand square feet. The architect chose mill finish aluminum due to the cost savings. A mill finish product will not rust and corrode and does not require a paint coating or chemical to maintain its structural integrity. This project was bid out for pricing both as a steel structure versus aluminum structure and in comparison, the aluminum structure was almost two million dollars lower in cost than steel. As discussed in the KAUST case study, in some cases, aluminum is designed as a long span truss. For a project in Sea World, a series of aluminum spaceframes and trusses were combined to provide supporting equipment over the aquatic area. These custom trusses carry the weight and flexible loading of SeaWorld’s acrobatic performers. Aluminum was selected specifically for this project because of its non-corrosive properties in a salt-water environment. Aquatic life is sensitive to impurities in the water and using aluminum eliminated the concern for corroding metal leaching into the tanks. The Lockheed Martin Gate in Fort Worth, Texas is a large trapezoidal structure with a span of 135 feet at one end and 106 feet at the other. It arches 30 feet to cover the entryway. The original concept drawing was designed as a structure only four feet deep. To incorporate additional maintenance access the truss was increased to 5 feet in depth. The designer was able to eliminate secondary steel and concrete support framing because of the strength of the aluminum and the geometry of the design. The truss is clad with aluminum panels and all exposed materials were painted with a Kynar finish. The interior trusses have the original mill finish. With aluminum trusses you eliminate the possibility for corrosion from simple condensation that would normally occur in this hot humid climate with a steel framed structure. This is particularly important, as the trusses in this design are fully enclosed and not easily visible or accessible for maintenance. James B. Walters, Design Engineer, rendered this concept model of a fast train station in Taiwan. Although it appears to be a large glass curved structure, only the gusset plates are curved in this hyperbolic structure. The glass lites are flat, segmented panels and are identical in size reducing the fabrication and material cost for the project. Using segmentation, designers can give the look of curved members to a large glass enclosure without adding cost. On a single-layer moment connected frame, beams come together and are fastened to gusset plates, one on the top and one on the bottom. The gusset plates are the only curved members – dished to accept the members properly. In most curved profiles, the plates are either concave or convex in shape creating curvature. In a hyperbolic structure, a professional can limit the number of identical glass panels to control costs.